While we tried to think of something clever to sell tonight's recipe to you, it really just comes down to the fact that the name of the dish includes the words, "Party Boats." If you need a better excuse to make this tasty appetizer, well, then, do it because City Market is having a sale on shrimp. Otherwise, PARTY BOATS! Cut off both ends of the plantains with large knife. Slice end to end in the grooves and peel. Cut the plantains into approximately 5 (2-inch) pieces. You should have approximately 15 pieces. Put them into a bowl with the cold water and salt. Set aside. In a large skillet heat about 2 to 3 inches of canola oil over medium heat. Dry the tostones with paper towels. Carefully drop them into the hot oil, in batches if necessary, and fry until they turn from peachy white to yellow, but not brown, about 2 to 3 minutes. Remove to paper towels to drain. Turn off your flame. Pat the tostones dry and cool briefly. Use a clear bowl or your hand to flatten them into round saucers. Watch through the bowl as you flatten them. Cook's Note: These are going to be your fiesta boats so they must be thick and large enough to hold the shrimp and for a toothpick to fit through them. So keep that in mind. Don't get upset if they aren't a perfect round shape or if they fall apart. That is why I recommend using 3 plantains so you have extra surface to work with. As they cool you can reshape them with your hands. Reheat the oil and add the tostones back to the skillet and fry for about 30 seconds on each side. Remove again to paper towels and sprinkle with salt. Set aside. In a large skillet heat 1 tablespoon of olive oil over a low flame. Add the shrimp to the skillet. Sprinkle with salt and pepper, to taste, a pinch of dried oregano and a squeeze of a small slice of lime. Cook until the shrimp turn pink. Combine the mayonnaise, ketchup, and minced garlic in olive oil in a small bowl. The color should be light pink. Squeeze a slice of lime juice into the mixture. Smear about 1/2 teaspoon of the topping on each of the tostones and season with salt. 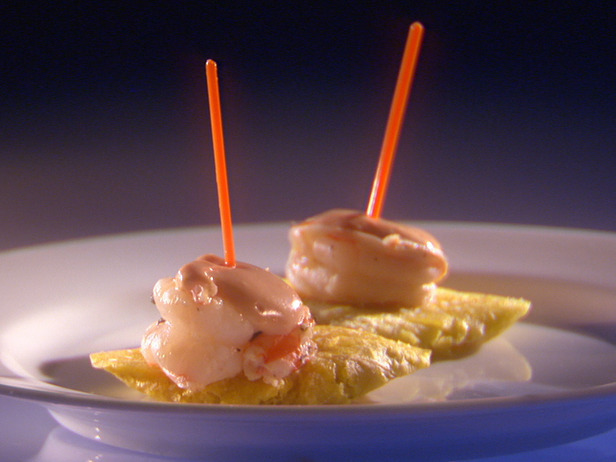 Top with 1 shrimp and secure it with a toothpick. Arrange on a colorful platter and serve.